Lovin' Lyrics Music Promotions: RESTLESS HEART'S THROWING A BEACH PARTY FOR CHILDHOOD CANCER RESEARCH! RESTLESS HEART'S THROWING A BEACH PARTY FOR CHILDHOOD CANCER RESEARCH! 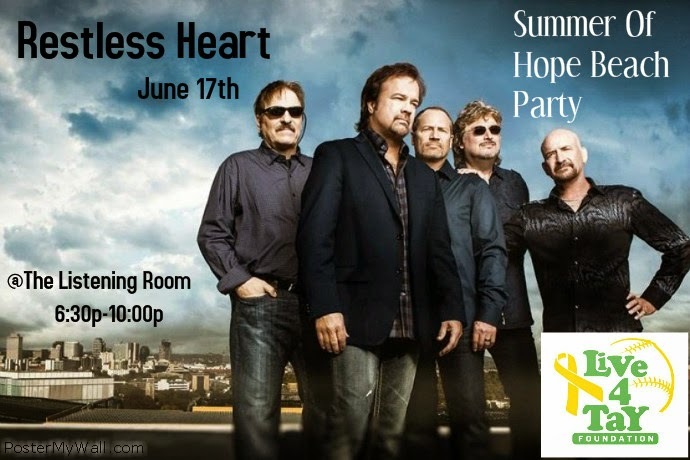 Restless Heart is gonna bring the heat to Music City next week with their Summer Of Hope Beach Party at The Listening Room Cafe and while they are music hitmakers, there no hit bigger than this one they're making to benefit childhood cancer research. The lineup so far? Some of country's best! 1) RESTLESS HEART: 4 Grammy nominations,7 CMA nominations,4 ACM nominations. "Why Does It Have To Be Wrong Or Right?" "When She Cries" and more. 2) BILLY YATES: Huge hits with George Jones "I Don't Need Your Rocking Chair" and "Choices". Cuts with Gary Allan, George Strait, Kenny Chesney, Tracy Lawrence, Sara Evans, etc. 3) BERNIE NELSON: His songs have sold over 25 million copies. Cuts with Mark Wills, Montgomery Gentry, Tracy Lawrence, Kenny Chesney, Wynonna, Randy Travis, Trace Adkins, Conway Twitty, Kris Kristofferson and more. 4) BRIAN WHITE: Hits with Rodney Atkins, Trace Adkins, Kix Brooks, Rascal Flatts, Gary Allan, Steve Holy, Blackhawk not to mention a ton of Christian cuts and #1's. 6) JAYCE HEIN: He'll be seen soon by the whole world on ABC's Extreme Weight Loss. Cuts with Jason Aldean, Gretchen Wilson and Casey James. 8) RYAN WEAVER: New artist who's current radio singles are "Crank It" and "New Set Of Tires". 9) AMBERS DRIVE: This trio is off the charts! Always requests to bring them back. Love these guys! 10) MELANIE SANDFORD: Singer songwriter and SURVIVOR! 11) SKYE CLAIRE: Artist "Pawn Shop"
12) PAYTON TAYLOR: New artist. 15) TRENT TOMLINSON: Singer/ Songwriter - Current Single "Come Back to Bed"